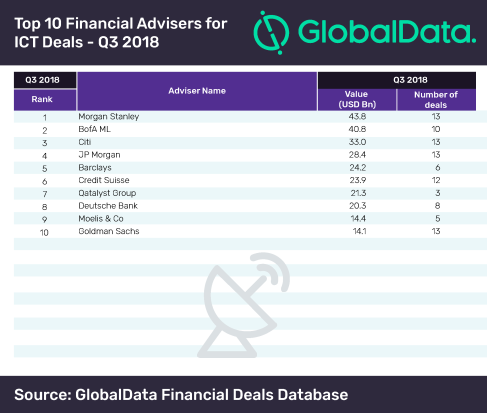 Morgan Stanley held the top rank in the latest M&A league table of the top 10 financial advisers for the ICT sector for Q3 2018, compiled by GlobalData, a leading data and analytics company. The bank took the top spot driven mostly by its top deal – Broadcom’s acquisition of CA Technologies for $18.9bn – apart from a total 13-deal wave (the highest number of deals for the sector in Q3 2018) that amounted to $43.8bn. According to GlobalData, which uses its tracking of all merger and acquisition, private equity/venture capital and asset transaction activity around the world to compile the league table, Bofa ML and Citi stood second and third with $40.8bn and $33.0bn, respectively. The ICT sector witnessed an overall surge of over 73% in value – from $90.73bn to $157.12bn – during Q3 2018 when compared to the same quarter in 2017. Volumes rose by nearly 29% from 2230 to 2868 during the quarters under review. The third-ranked, Citi, outpaced the competition in the global league table of top 20 M&A financial advisers released by GlobalData recently. ICT sector’s top adviser Morgan Stanley stood fourth in the global list. 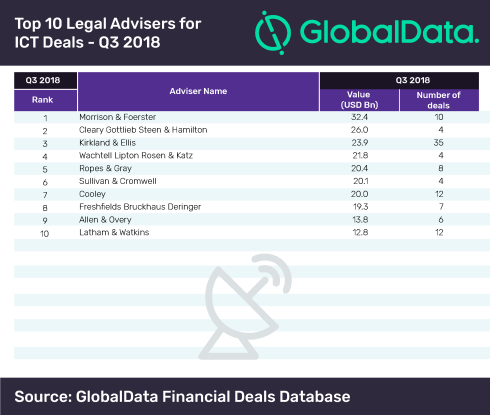 US-based law firm Morrison & Foerster led the top 10 legal advisers table for Q3 2018 with a value of $32.4bn. Despite accumulating the highest number of deals at 35, Kirkland & Ellis could only take third rank with a value of $23.9bn. Legal firm Cleary Gottlieb Steen & Hamilton – one among the three with the least number of deals – managed a dynamic climb to the second spot by advising on high-value transactions.